Enzymes of the aldehyde ferredoxin oxidoreductase (AOR) family (PUBMED:9242907) contain a tungsten cofactor and an 4Fe4S cluster and catalyse the interconversion of aldehydes to carboxylates (PUBMED:8672295). This family includes AOR, formaldehyde ferredoxin oxidoreductase (FOR), glyceraldehyde-3-phosphate ferredoxin oxidoreductase (GAPOR), all isolated from hyperthermophilic archea (PUBMED:9242907); carboxylic acid reductase found in clostridia (PUBMED:2550230); and hydroxycarboxylate viologen oxidoreductase from Proteus vulgaris, the sole member of the AOR family containing molybdenum (PUBMED:8026480). GAPOR may be involved in glycolysis (PUBMED:7721730), but the functions of the other proteins are not yet clear. AOR has been proposed to be the primary enzyme responsible for oxidising the aldehydes that are produced by the 2-keto acid oxidoreductases (PUBMED:9275170). Enzymes of the aldehyde ferredoxin oxidoreductase (AOR) family [(PUBMED:9242907)] contain a tungsten cofactor and an 4Fe4S cluster and catalyse the interconversion of aldehydes to carboxylates [(PUBMED:8672295)]. This family includes AOR, formaldehyde ferredoxin oxidoreductase (FOR), glyceraldehyde-3-phosphate ferredoxin oxidoreductase (GAPOR), all isolated from hyperthermophilic archea [(PUBMED:9242907)]; carboxylic acid reductase found in clostridia [(PUBMED:2550230)]; and hydroxycarboxylate viologen oxidoreductase from Proteus vulgaris, the sole member of the AOR family containing molybdenum [(PUBMED:8026480)]. GAPOR may be involved in glycolysis [(PUBMED:7721730)], but the functions of the other proteins are not yet clear. AOR has been proposed to be the primary enzyme responsible for oxidising the aldehydes that are produced by the 2-keto acid oxidoreductases [(PUBMED:9275170)]. This entry represents the N-terminal domain of these enzymes. 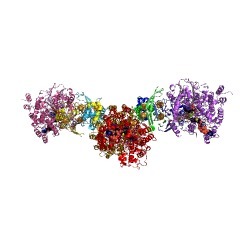 This domain has been shown to interact with the tungsten cofactor [(PUBMED:7878465)]. There are 5747 AFOR_N domains in 5747 proteins in SMART's nrdb database. Taxonomic distribution of proteins containing AFOR_N domain. This tree includes only several representative species. The complete taxonomic breakdown of all proteins with AFOR_N domain is also avaliable. Click on the protein counts, or double click on taxonomic names to display all proteins containing AFOR_N domain in the selected taxonomic class. Binding / catalysis: Aldehyde ferredoxin oxidoreductase (AOR) catalyses the reversible oxidation of aldehydes to their corresponding carboxylic acids with their accompanying reduction of the redox protein ferredoxin. This domain interacts with the tungsten cofactor. Molybdenum-cofactor-containing enzymes: structure and mechanism. Molybdenum-containing enzymes catalyze basic metabolic reactions in the nitrogen, sulfur, and carbon cycles. With the exception of the nitrogenase cofactor, molybdenum is incorporated into proteins as the molybdenum cofactor that contains a mononuclear molybdenum atom coordinated to the sulfur atoms of a pterin derivative named molybdopterin. Certain microorganisms can also utilize tungsten in a similar fashion. Molybdenum-cofactor-containing enzymes catalyze the transfer of an oxygen atom, ultimately derived from or incorporated into water, to or from a substrate in a two-electron redox reaction. On the basis of sequence alignments and spectroscopic properties, four families of molybdenum-cofactor-containing enzymes have been identified. The available crystallographic structures for members of these families are discussed within the framework of the active site structure and catalytic mechanisms of molybdenum-cofactor-containing enzymes. Although the function of the molybdopterin ligand has not yet been conclusively established, interactions of this ligand with the coordinated metal are sensitive to the oxidation state, indicating that the molybdopterin may be directly involved in the enzymatic mechanism. Pyruvate ferredoxin oxidoreductase from the hyperthermophilic archaeon, Pyrococcus furiosus, functions as a CoA-dependent pyruvate decarboxylase. Pyruvate ferredoxin oxidoreductase (POR) has been previously purified from the hyperthermophilic archaeon, Pyrococcus furiosus, an organism that grows optimally at 100 degrees C by fermenting carbohydrates and peptides. The enzyme contains thiamine pyrophosphate and catalyzes the oxidative decarboxylation of pyruvate to acetyl-CoA and CO2 and reduces P. furiosus ferredoxin. Here we show that this enzyme also catalyzes the formation of acetaldehyde from pyruvate in a CoA-dependent reaction. Desulfocoenzyme A substituted for CoA showing that the cofactor plays a structural rather than a catalytic role. Ferredoxin was not necessary for the pyruvate decarboxylase activity of POR, nor did it inhibit acetaldehyde production. The apparent Km values for CoA and pyruvate were 0.11 mM and 1.1 mM, respectively, and the optimal temperature for acetaldehyde formation was above 90 degrees C. These data are comparable to those previously determined for the pyruvate oxidation reaction of POR. At 80 degrees C (pH 8.0), the apparent Vm value for pyruvate decarboxylation was about 40% of the apparent Vm value for pyruvate oxidation rate (using P. furiosus ferredoxin as the electron acceptor). Tentative catalytic mechanisms for these two reactions are presented. In addition to POR, three other 2-keto acid ferredoxin oxidoreductases are involved in peptide fermentation by hyperthermophilic archaea. It is proposed that the various aldehydes produced by these oxidoreductases in vivo are used by two aldehyde-utilizing enzymes, alcohol dehydrogenase and aldehyde ferredoxin oxidoreductase, the physiological roles of which were previously unknown. Tungsten (atomic number 74) and the chemically analogous and very similar metal molybdenum (atomic number 42) are minor yet equally abundant elements on this planet. The essential role of molybdenum in biology has been known for decades and molybdoenzymes are ubiquitous. Yet, it is only recently that a biological role for tungsten has been established in prokaryotes, although not as yet in eukaryotes. The best characterized organisms with regard to their metabolism of tungsten are certain species of hyperthermophilic archaea (Pyrococcus furiosus and Thermococcus litoralis), methanogens (Methanobacterium thermoautotrophicum and Mb. wolfei), Gram-positive bacteria (Clostridium thermoaceticum, C. formicoaceticum and Eubacterium acidaminophilum), Gram-negative anaerobes (Desulfovibrio gigas and Pelobacter acetylenicus) and Gram-negative aerobes (Methylobacterium sp. RXM). Of these, only the hyperthermophilic archaea appear to be obligately tungsten-dependent. Four different types of tungstoenzyme have been purified: formate dehydrogenase, formyl methanufuran dehydrogenase, acetylene hydratase, and a class of phylogenetically related oxidoreductases that catalyze the reversible oxidation of aldehydes. These are carboxylic reductase, and three ferredoxin-dependent oxidoreductases which oxidize various aldehydes, formaldehyde and glyceraldehyde 3-phosphate. All tungstoenzymes catalyze redox tungsten in these enzymes is bound by a pterin moiety similar to that found in molybdoenzymes. The first crystal structure of a tungsten- or pterin-containing enzyme, that of aldehyde ferredoxin oxidoreductase from P. furiosus, has revealed a catalytic site with one W atom coordinated to two pterin molecules which are themselves bridged by a magnesium ion. The geochemical, ecological, biochemical and phylogenetic basis for W- vs. Mo-dependent organisms is discussed. Structure of a hyperthermophilic tungstopterin enzyme, aldehyde ferredoxin oxidoreductase. 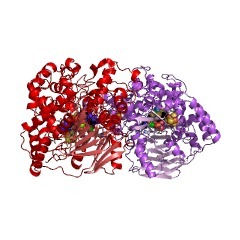 The crystal structure of the tungsten-containing aldehyde ferredoxin oxidoreductase (AOR) from Pyrococcus furiosus, a hyperthermophilic archaeon (formerly archaebacterium) that grows optimally at 100 degrees C, has been determined at 2.3 angstrom resolution by means of multiple isomorphous replacement and multiple crystal form averaging. AOR consists of two identical subunits, each containing an Fe4S4 cluster and a molybdopterin-based tungsten cofactor that is analogous to the molybdenum cofactor found in a large class of oxotransferases. Whereas the general features of the tungsten coordination in this cofactor were consistent with a previously proposed structure, each AOR subunit unexpectedly contained two molybdopterin molecules that coordinate a tungsten by a total of four sulfur ligands, and the pterin system was modified by an intramolecular cyclization that generated a three-ringed structure. In comparison to other proteins, the hyperthermophilic enzyme AOR has a relatively small solvent-exposed surface area, and a relatively large number of both ion pairs and buried atoms. 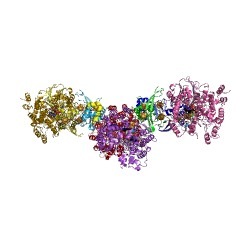 These properties may contribute to the extreme thermostability of this enzyme. 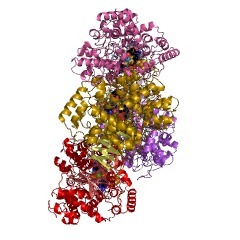 Glyceraldehyde-3-phosphate ferredoxin oxidoreductase, a novel tungsten-containing enzyme with a potential glycolytic role in the hyperthermophilic archaeon Pyrococcus furiosus. The archaeon Pyrococcus furiosus grows optimally at 100 degrees C by the fermentation of carbohydrates to yield acetate, CO2, and H2. Cell-free extracts contain very low activity of the glycolytic enzyme, glyceraldehyde-3-phosphate dehydrogenase, but extremely high activity of glyceraldehyde-3-phosphate ferredoxin oxidoreductase (GAPOR). GAPOR was purified under strictly anaerobic conditions. It is a monomeric, O2-sensitive protein of M(r) approximately 63,000 which contains pterin and approximately 1 tungsten and 6 iron atoms per molecule. The enzyme oxidized glyceraldehyde-3-phosphate (Km 28 microM) to 3-phosphoglycerate and reduced P. furiosus ferredoxin (Km 6 microM), but it did not oxidize formaldehyde, acetaldehyde, glyceraldehyde, benzaldehyde, glucose, glucose 6-phosphate, or glyoxylate, nor did it use NAD(P) as an electron acceptor. It is proposed that GAPOR has a glycolytic role and functions in place of glyceraldehyde-3-phosphate dehydrogenase and possibly phosphoglycerate kinase. The (2R)-hydroxycarboxylate-viologen-oxidoreductase from Proteus vulgaris is a molybdenum-containing iron-sulphur protein. An oxidoreductase with an extremely broad substrate specificity reducing reversibly 2-oxocarboxylates at the expense of reduced artificial redox mediators to (2R)-hydroxycarboxylates has been purified to a specific activity of up to 1800 mumol.min-1.mg-1 for the reduction of phenylpyruvate. The membrane-bound non-pyridine nucleotide-dependent enzyme appears in the form of various oligomers of the 80-kDa monomer. The isoelectric point is 5.1. Based on a molecular mass of 80 kDa the enzyme contains up to one molybdenum, four iron and four sulphur atoms. After growth on 99Mo-labelled molybdate, enzyme and radioactivity coincided as shown by gel electrophoresis. Permanganate oxidation delivers 0.7 mol pterin-6-carboxylic acid. The molybdenum cofactor is a mononucleotide. The enzyme is inhibited by cyanide. The first 20 amino acids have been determined. The enzyme belongs to the rare group of molybdoenzymes which possess no further prosthetic groups than the iron-sulphur clusters. Carboxylic acid reductase: a new tungsten enzyme catalyses the reduction of non-activated carboxylic acids to aldehydes. An enzyme which we call carboxylic acid reductase (aldehyde dehydrogenase) seems to be the first which is able to reduce non-activated carboxylic acids to aldehydes at the expense of reduced viologens. There is no further reduction of the aldehydes to the corresponding alcohols. In the presence of oxidized viologens aldehydes can be dehydrogenated to carboxylic acids roughly 20 times faster than the latter are reduced. The specific enzyme activity in crude extracts is about 100 times increased if 10 microM tungstate and a sulphur source in addition to sulphate is given to the growth medium of Clostridium thermoaceticum. Carboxylic acid reductase seems to be present in two forms. One has an apparent molecular mass of about 240 kDa and is bound to red-Sepharose, whereas, the other, a form of an apparent molecular mass of about 60 kDa, is not bound. SDS gel electrophoresis shows a higher complexity. The very labile enzyme has been enriched by a factor of about 145 by binding to octyl-Sepharose and further chromatographic separation by red-Sepharose and FPLC using Mono-Q and phenyl-Superose columns. After cell growth in the presence of [185W]tungstate, radioactivity coincides with the two forms of enzyme activity during all purification steps. This is also the case when the enzyme is electrophoretically separated on polyacrylamide slab gels.